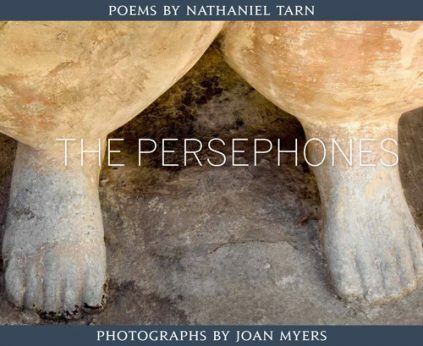 In The Persephones, internationally known poet Nathaniel Tarn and photographer Joan Myers have collaborated on an elegant re-telling of the myth of Persephone’s abduction by Hades into the Underworld. First published in 1974, and again in 2009 in a limited, collector’s edition (both of which are out of print), these poems have attracted a devoted readership. This beautifully designed and produced edition at an affordable price pairs the poems with Myers’s stunning photographs, many of which were shot at the sites from which the myth originated. Nathaniel Tarn (born 1928) is a British-born poet, essayist, translator, and former publisher whom Kenneth Rexroth has called “One of the most outstanding poets of his generation.” He has published some thirty books in his various disciplines and his work has been translated into ten languages. Joan Myers (born 1944) is the author of Fire and Ice: Timescapes (Damiani 2014). Her highly acclaimed work has been the focus of three Smithsonian exhibitions, more than fifty solo and eighty group shows, and eight books. Her work is held in the permanent collections of Bibliotèque National de Paris, Center for Creative Photography, and the Museum of Modern Art, among others.